President Emmanuel Macron’s New Year’s Eve address to the nation made it perfectly clear that after one unconvincing stab at throwing a few crumbs to the Gilets Jaunes (Yellow Vests) protest movement, he has determined to get tough. The absence of leaders is inherent in the movement. All politicians, even friendly ones, are mistrusted and no one is looking for a new leader. People are organizing their own meetings to develop their lists of grievances and demands. In the village of Commercy, Lorraine, a half hour drive from Domrémy where Jeanne d’Arc was born, inhabitants gather to read their proclamation. Six of them read in turns, a paragraph each, making it quite clear that they want no leaders, no special spokesperson. They sometimes stumble over a word, they are not used to speaking in public like the TV talking heads. Their “Second appeal of the Gilets Jaunes de Commercy invites others to come to Commercy on January 26-27 for an “assembly of assemblies”. The people who first went out in the streets wearing Yellow Vests last November 17 were ostensibly protesting against a hike in gasoline and diesel taxes that would hit people in rural France the hardest. Obsessed with favoring “world cities”, the French government has taken one measure after another at the expense of small towns and villages and the people who live there. That was just the last straw. The movement rapidly moved on to the basic issue: the right of the people to have a say in measures taken that affect their lives. Democracy, in a word. For decades, parties of the left and of the right, whatever their campaign speeches, once in office pursue policies dictated by “the markets”. For this reason, people have lost confidence in all parties and all politicians and are demanding new ways to get their wishes heard. The fuel tax was soon forgotten as the list of demands grew longer. Critics of the movement note that achieving so many demands is quite impossible. It’s no use paying attention to popular demands, because the silly people ask for everything and its opposite. That objection is answered by what has quickly emerged as the single overriding demand of the movement: the Citizens’ Initiative Referendum (CIR). This demand illustrates the good sense of the movement. Rather than making a “must” list, the GJ merely ask that the people be allowed to choose, and the referendum is the way to choose. The demand is for a certain number of signatories – perhaps 700,000, perhaps more – to gain the right to call a referendum on an issue of their choice. The right to a CIR exists in Switzerland, Italy and California. The idea horrifies all those whose profession it is to know best. If the people vote, they will vote for all sorts of absurd things, the better-knowers observe with a shudder. A modest teacher in a junior college in Marseilles, Etienne Chouard, has been developing for decades ideas on how to organize direct democracy, with the referendum at its center. His hour has come with the Yellow Vests. He insists that a referendum must always be held after a long debate and time for reflection, to avoid emotional spur-of-the-moment decisions. Such a referendum requires honest, independent media which are not all owned by special interests. It requires making sure that politicians who make the laws follow the popular will expressed in the referendum. All this suggests the need for a people’s constitutional convention. From the start, the government has reacted with violence, in an apparent desire to provoke responding violence in order to condemn the movement as violent. An army of police, dressed like robots, have surrounded and blocked groups of peaceful Yellow Vests, drowning them in clouds of teargas and firing flash balls directly at protesters, seriously wounding hundreds (no official figures). A number of people have lost an eye or a hand. The government has nothing to say about this. On the third Saturday of protest, this army of police was unable to stop – or under orders to allow – a large number of hoodlums or Black Blocs (who knows?) infiltrate the movement and smash property, vandalize shops, set fire to trash cans and parked cars, providing the world media with images proving that the Yellow Vests are dangerously violent. Despite all this provocation, the Gilets Jaunes have remained remarkably calm and determined. But there are bound to be a few people who lose their tempers and try to fight back. On the 8th Saturday, January 5, a squad of plexiglass-protected police were violently attacking Gilets Jaunes on a bridge over the Seine when a big guy lost his temper, emerged from the crowd and went on the attack. With his fists, he beat down one policeman and caused the others to retreat. This amazing scene was filmed. You could see Yellow Vests trying to hold him back, but Rambo was unstoppable. It turned out that this was Christophe Dettinger, a French Rom, former light heavyweight boxing champion of France. His nickname is “the Gypsy of Massy”. He got away from the scene, but made a video before turning himself in. “I reacted badly”, he said, when he saw police attacking women and other defenseless people. He urged the movement to go ahead peacefully. Dettinger faces seven years in prison. Within a day, his defense fund had gathered 116,433 euros. The government shut it down – on what legal pretext I don’t know. Now a petition circulates on his behalf. In his New Year’s Eve address, Macron patronizingly scolded his people telling them that “you can’t work less and earn more” – as if they all aspired to spending their lives lounging on a yacht and watching stock prices rise and fall. The Gilets Jaunes haven’t been “going after” anybody. The police have been “going after” them. People have indeed spoken up vigorously against camera crews of channels that systematically distort the movement. Not a word has been heard from the movement against foreigners or homosexuals. The key word is Jews. Qui veut noyer son chien l’accuse de la rage. (French proverb). As the French saying goes, whoever wants to drown his dog claims he has rabies. Today whoever wants to ruin a career, take vengeance on a rival, disgrace an individual or destroy a movement accuses her, him, or it of antisemitism. So, faced with a rising democratic movement, playing the “antisemitism” card was inevitable. It was almost a sure thing statistically. In almost any random batch of hundreds of thousands of people, you might find one or two who have something negative to say about a Jew. That’ll do it. The media hawks are on the outlook. The slightest incident can be used to suggest that the real motive of the movement is to revive the Holocaust. This gently ironic little song, performed on one of France’s traffic circles, contrasts the “nice” establishment with the “bad” ordinary folk. It is a huge hit on YouTube. It gives the tone of the movement. Les Gentils et les Méchants. It didn’t take long for this merry number to be accused of antisemitism. Why? Because it was ironically dedicated to two of the very most virulent critics of the Gilets Jaunes: May ’68 star Daniel Cohn-Bendit and old “new philosopher” Bernard-Henri Lévy. The new generation can’t stand them. But wait, they happen to be Jewish. Aha! Anti-Semitism! Faced with what government spokesman Benjamin Griveaux described as “agitators” and “insurrectionists” who want to “overthrow the government”, Prime Minister Edouard Philippe announced a new “law to better protect the right to demonstrate”. Its main measure: heavily punish organizers of a demonstration whose time and place have not had official approval. Ferry called on Macron to make a coalition with the Republicans in order to push through his “reforms”. Wherever people gather, Antifa groups may pursue their indiscriminate search to root out “fascists”. 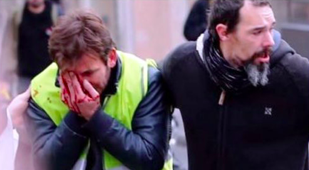 In Bordeaux last Saturday, Yellow Vests had to fight off an attack by Antifa. It is now completely clear (as indeed it always has been) that the self-styled “Antifascists” are the watch dogs of the status quo. In their tireless search for “fascists”, the Antifa attack anything that moves. In effect, they protect stagnation. And curiously enough, Antifa violence is tolerated by the same State and the same police who insult, attack and arrest more peaceful demonstrators. In short, the Antifa are the storm troopers of the current system. Be skeptical. At least in France, mainstream media are solidly on the side of “order”, meaning Macron, and foreign media tend to echo what national media write and say. Also, as a general rule, when it comes to France, the Anglophone media often get it wrong. It is not in sight. This may not be a revolution, but it is a revelation of the real nature of “the system”. Power lies with a technocracy in the service of “the Markets”, meaning the power of finance capital. This technocracy aspires to remake human society, our own societies and those all over the planet, in the interests of a certain capitalism. It uses economic sanctions, overwhelming propaganda and military force (NATO) in a “globalization” project that shapes people’s lives without their consent. Macron is the very embodiment of this system. He was chosen by that famous elite to carry through the measures dictated by “the Markets”, enforced by the European Union. He cannot give in. But now that people are awake to what is going on, they won’t stop either. For all the lamented decline in the school system, the French people today are as well-educated and reasonable as any population can be expected to be. If they are incapable of democracy, then democracy is impossible. I would like to believe in such a movement, however history teaches us that spontaneous action doesn’t occur. What or who is behind this and for what ends? We are continually being played, why would this resistance be any different? Real resistance is at the individual level, forms of civil disobedience that attract little publicity, the whole feel of this movement feels stage managed.